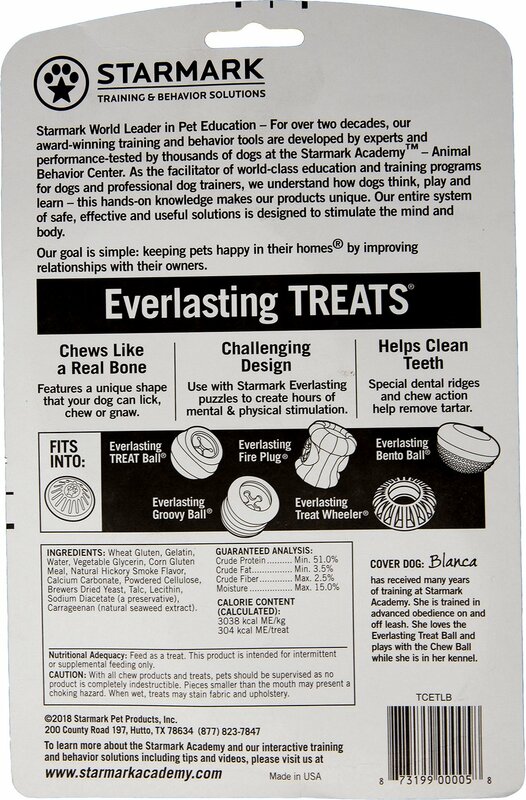 Everlasting Treats are long-lasting dental chews that are hard like a bone to help keep your dog's teeth clean. Starmark Treats are made from natural ingredients without plastics or polymers, and are edible and digestible with an irresistible taste. These treats can be eaten as a snack, or use them inside the Starmark Mental Stimulation toys to create hours of mental and physical stimulation. Chews Like a Real Bone. Helps clean teeth & gums. Great tasting — Natural Hickory flavor dogs love! Click here for Starmark Everlasting Treat Toys. 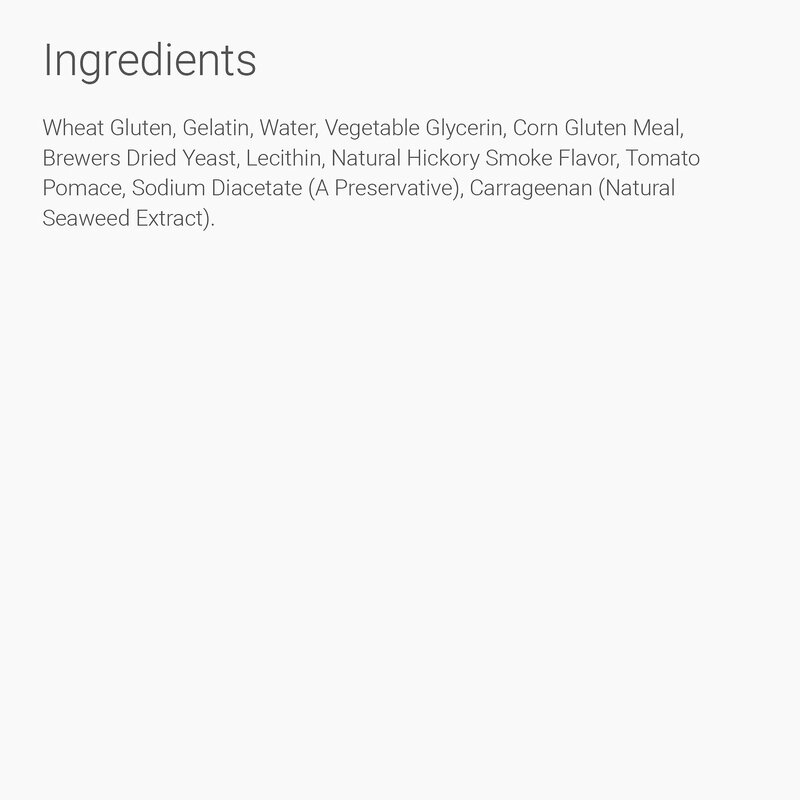 Wheat Gluten, Gelatin, Water, Vegetable Glycerin, Corn Gluten Meal, Natural Hickory Smoke Flavor, Calcium Carbonate, Powdered Cellulose, Brewers Dried Yeast, Talc, Lecithin, Sodium Diacetate (a preservative), Carrageenan (natural seaweed extract). I have the Large bento ball and the Large everlasting treat ball for my two ~60lb dogs. They took a while to get through the original treats they came with, as well as the chicken ones I got them next. They’re definitely more into this flavor, but I’ve got one (major) issue... one of my dogs has managed to get these treats out of BOTH treat balls... for a total of 3 times. He’s a gulper and is rather protective of things he wants, so I’ve decided he can no longer have this treat. Not sure if this is a sizing issue with this particular flavor/batch, or if the treat balls are stretching/losing their ability to hold the treats. My dogs love these. They don’t last long though as they both get them out pretty quickly then chew them up. The worst thing about these is that they’re made in China, with questionable ingredients. Many big pet stores are beginning to stop carrying such items. I’d be glad to find an alternative from somewhere that doesn’t use potentially life-threatening ingredients in their digestible animal products! 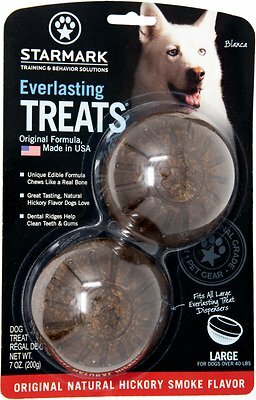 The labradors love the hickory flavor of the everlasting treats. They really enjoy trying to get them out of the star Mark puzzle toys. Once the treats are out it is only a few minutes before they are gobbled it right up. The treats are made in the United States so I feel good about giving them a quality treat. As other reviewer‘s have noted the Hickory treat does leave a slight stain but will easily be removed with soap and water. 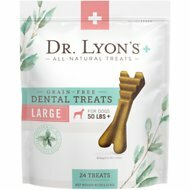 I brought these smoke flavor dental chews for my dog thinking he would love them and his teeth would get the cleaning they needed.. boy was I wrong. the treat itself looks and smells appetizing .. that's not the problem.. I've brought a dehydrator and dehydrate fresh chicken with parsley and garlic.. he wont eat anything else as far as treats goes..
My dog is a heavy chewer. She tears apart all of her new toys on a daily basis, even kongs. I really hoped these would be something that would keep her busy but she won't even touch them, unfortunately. These toys are very heavy and durable. If your pet is a chewer and enjoys chewing on this kind of toy then yes, I would reccomend it. These chews are a favorite with my dogs. They love to chew on them and hickory smoke flavoring is their favorite. I do like these treats and my dog goes after them! I believe I got the wrong size treat this time, but they did look smaller online. My dog went right through these. She absolutely could not stop until devoured. It was gone within a day. I worry that maybe she ate it too fast. I ordered the hydrant to put it into, but she was still able to get it out and eat it in a day. Probably her favorite toy, wish she wasn't so clever to get it out as quickly as she did. My dogs both loved these! Will buy again! Lasted longer than most toys! I hoped that this would take some time for my dog to eat but as soon as he gets it out of the holder, it's only a matter of minutes before it's gone.